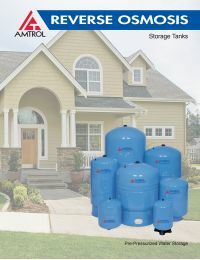 Amtrol water storage tanks are built tough to last. Each tank is individually tested, making them extremely safe. They're designed to meet the most demanding specifications for potable water. Each Amtrol RO storage tank has a fully enclosed polypropylene and butyl water reservoir to ensure water purity, with less rubber/water contact. Amtrol has the most comprehensive five year warranty in the industry. Reverse Osmosis Tank Maintenance and Accessories: For optimal performance, it is necessary to keep a pre-charge of approximately 7 psi in your tank. Most automotive tire pressure gauges either do not read below 10 psi, or are not very accurate at pressures this low. 54846 Tank Pressure Gauge reads pressures between 0 and 20 psi, making it perfect for RO tank maintenance. The RO tank should be sanitized before initial use and during every filter change. The Reverse Osmosis Sanitizing Maintenance Kit features Sani-System, an EPA & NSF certified sanitizer, making it a great alternative to using chlorine bleach. The kit also includes a syringe for application of the sanitizer.